This morning, The Fort welcomed Mister Barkley. 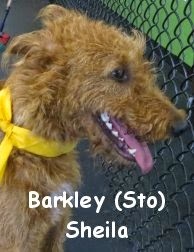 Barkley is a thirty pound one-year-old Irish Terrier whom loves to play. He came in curious as to what The Fort was and what to do here. After meeting some other pack members, like Kaya (as seen in the video below), and learning that he was not here for a "vet visit" he warmed up to the others and began to have a wonderful time playing with the pack in the medium roll. Barkley also determined that this was similar to a dog park (although different) since he was able to interact with fellow pack members. Barkley is continuing to relax and play with the pack while enjoying his time here. He is prepared to return to Fort Fido, elated to see and make new friends. Willow... This one's a heart-melter!